Q: National parks don’t just preserve spectacular landscapes and wildlife. They also honor the people who have changed history and influenced American culture, from the Wright brothers to Harriet Tubman to Eugene O’Neill. Two noteworthy people have more national park sites named after them than anyone else, with four sites each. Can you name these two celebrated historic figures? A statue of one of the most-celebrated people in the national parks. Photo © Cvandyke/Dreamstime. A: Though national parks preserve the life stories of many people, including Civil Rights leaders, artists, inventors, and explorers, more than two dozen sites specifically honor former U.S. presidents. Of this elite group, two men loom large. The Great Emancipator, Abraham Lincoln, and the nation’s first conservation president, Theodore Roosevelt, each have four national parks that bear their names. From his first log cabin in the South to his time in Washington, D.C., national park sites trace Abraham Lincoln’s steps from his birth to his days governing the country during the Civil War. The Abraham Lincoln Birthplace National Historic Site in Kentucky preserves remnants of two farm sites where Lincoln was born and lived until he was seven. Visitors can see a log cabin similar to Lincoln’s first home, though the original was dismantled 150 years ago. The Lincoln Memorial in Washington, D.C., honors Lincoln with a 19-foot marble statue under a 99-foot-tall structure modeled after the Greek Parthenon. This monument on the National Mall, completed in 1922, is one of the most-visited national park sites in the country, and includes murals, inscriptions from two of Lincoln’s speeches, and fluted Doric columns representing the 36 states in the union at the time of his death. The Lincoln Boyhood National Memorial in Indiana features a recreation of the homestead where Lincoln lived with his family from age 7 to age 21, with a memorial building, a replica farm house, and a working historic farm. Lincoln’s mother is buried on a hilltop on the premises. The Lincoln Home National Historic Site in Illinois preserves the one house Lincoln ever owned, where he lived with his wife Mary Todd Lincoln before serving as president. The home and several other nearby buildings are restored as closely as possible to their appearance during Lincoln’s time. Mount Rushmmore National Monument in South Dakota. © Welcomia/Dreamstime. As president, Theodore Roosevelt created the first national parks, established what is now the U.S. Forest Service, and helped conserve more than 230 million acres of public land—so it’s no wonder he’s well-represented in the park system. Theodore Roosevelt Island National Memorial in Washington, D.C. is an 88.5-acre island in the middle of the Potomac River featuring a memorial plaza with a fountain and a statue of Roosevelt amidst an undeveloped natural landscape. The Theodore Roosevelt Inaugural National Historic Site in Buffalo, New York, preserves the home where Roosevelt was sworn into office in a small, solemn ceremony after the assassination of President William McKinley in 1901. The house now includes a visitor center with interactive exhibits and a recreation of Roosevelt’s presidential desk. Theodore Roosevelt National Park in North Dakota preserves part of the wild landscape where Roosevelt developed his conservation ethic and his love of nature. The park’s three units cover more than 70,000 acres and the remains of several of his ranches, including an original log cabin built by Roosevelt’s staff furnished with period furniture. Note that these sites are specifically the national parks that contain these men’s names. 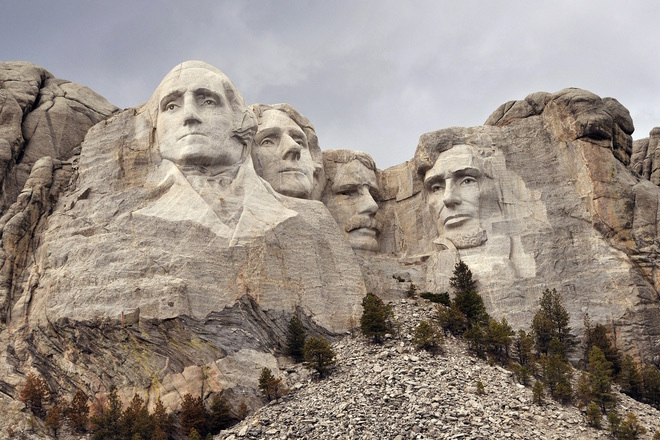 Other sites immortalize pieces of their history—or even, in the case of Mount Rushmore National Memorial in South Dakota, their larger-than-life faces.